This month Design Tips focuses on fonts and the innovative things you can do with fonts from within Cutting Shop. Once you have mastered a few Cutting Shop basics you can quickly knock out professional grade signage in just a few minutes. Since Cutting Shop’s basic font outlining seems to be easily understood by everyone, or at least everyone who has glanced at the manual, we won’t go into that now. Curve text additionally places text on what ever polyline you have selected, which is a line with black dots at each end. Remember that Cutting Shop’s Polylines consist of long lines and arcs and are designed so that editing is a snap. Because text tools create polylines, and use Optimize (see Design Tips 1, Optimize) you should have Show Points on (F2); otherwise it is difficult to determine if the result is as good as it can be. It is also necessary when using Curve Text so that you can determine exactly where your text will flow. The examples on the left were created with the Text Tool. 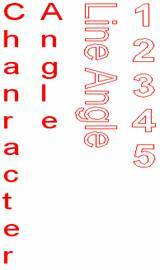 “Character Angle” was written with “Angle” on the first line and “Character” on the next line. Character Angle was set to 90 and Text Line Angle set to 270; this has not been “Converted to Polylines,” so it is still a font. “Line Angle” was set to 270 and “Relative Character Angle” was 0. This was “Converted to Polylines” and is made of lines and arcs in a polyline format. The vertical numbers are a typical design with address numbers. We’ve had a lot of questions regarding Cutting Shop “Stroke Fonts.” Stroke fonts are optional; there are several fonts available. These fonts work with both the Text tool and the Curve Text tool. Cutting Shop Stroke fonts do not work within other programs. We have centerline stroke fonts and outline stroke fonts. For example, outlining the simplest letter T in a TrueType form requires a total of 8 lines. Whereas the simplest T in a Stroke font is 2 lines, the down stroke and the cross bar. These are typically used when marking parts. 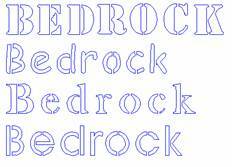 There are 4 centerline Stroke fonts available. 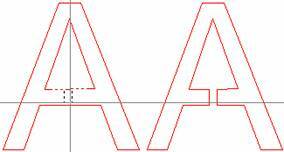 Like TrueType fonts, Stoke fonts must also be “Converted to Polylines” so that they can be cut. Curve Text follows a pre-drawn curve. The curve is a polyline which can be made of a series of lines and arcs. The start and stop positions of the Polyline should each have a black point (f2). To put text on circle first use the Con P/L tool to convert the circle into two arcs. Use the Insert Point tool to insert the starting and ending points of the polyline you want to follow. Then use the Cleave tool on each of the new points; it defines a polyline. In the above example the polyline was selected and the font followed the curve. However the font is just above the line. In the following example the font was lowered so that the bottoms of the individual letters were just below the curve. With the letters touching a closed polygon it is a simple step to Weld the letters so that there is a continuous line running around the part. The Curve Text dialogue on the right is used to insert text on a polyline and is where you lower your font onto the polyline. Enter a negative value into “Offset from Curve” to lower the font. This value can be measured with the Draw tool. Zoom into an area that includes both the curve and the bottom of a letter. With the Draw tool active, click near the bottom of the letter then move the curser to the line but don’t click. Now read the value at the bottom left box at the bottom of the screen. This is an approximate value and is accurate enough to get a value that you can work with. Fill Right click to cancel drawing the line. Fill in the Offset value and click OK.
We occasionally get queries about placing text on the bottom line in a polyline with the text on the inside of the polygon. This is a good question, because if after placing your text where you want it and converting to polylines, the next step would normally be to weld. However this does not work with text inside a polygon; the text disappears leaving behind points on the polyline. So, instead of using the Weld tool; Select All (Ctrl A) then from the drop down menu at the top of the screen choose Edit/Break at intersections. Show Points (F2) should be on. Break at intersections puts a point at the position where two lines cross. The lines you don’t want are then easily deleted with the Delete tool, or Selected with the Select tool and then deleted, with the Delete key on your keyboard. When done Uncleave to ensure all your lines are closed. In the this example a gray solid fill was used to hi-light the parts. Notice that pieces of the M, A, K and O will fall out. Check out the Bridge tool. The Text tool makes letters with uniform spacing. 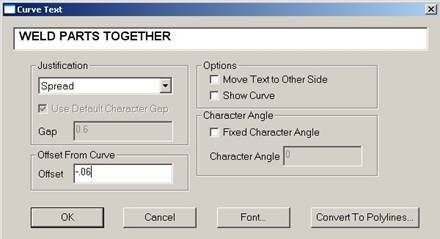 If you need to control the spacing between letters use the Curve text tool. Just draw a line the length that you need for your letters and then with the Curve Text tool click on the line and type your message. Use “Spread” justification so that the letters are spread over the entire length of the line. Bridging is used to keep parts from falling out. First you’ll need to know how large to make the bridge. If you don’t know what the size should be, try measuring with the Draw tool. The thickness of a leg of a letter or half the thickness of the leg might be what you need. With the Bridge tool active, double left click to get the Bridge dialogue box. Change the bridge size and click on a line that you want to be bridged; the line you picked will become dashed, tool guides will appear as black dashed lines, the guides show where your bridge will be. If you don’t see any guides, you have not clicked on a line, or your bridge is larger than the area you are bridging. If the bridge guides are where you want it to be then click on the second line and the bridge forms. Stretch is another option when dressing up your drawing. When using Stretch be sure that Show Points (F2) is on. 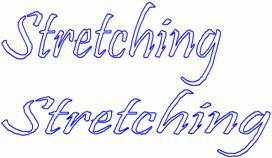 Stretching tends to put additional points on elements that are being stretched. You might want to use the Optimize tool to reduce node points. The Warp tool is another tool that can help you make a sign pop. Warp has several pre-designed shapes. With the Warp tool active double-left click to view your shapes, then draw a box around the parts that you want to be warped. 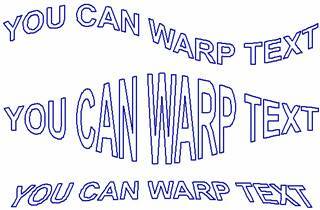 Repeating the process increases the amount of warp, or you can apply different warps sequentially to produce new effects.